I came across a program called Wealthy Agency, which is a new program created by Jamie Lewis, a seasoned internet marketer. Jamie claims he has a new system that can help you build a six-figure a month business ($100,000 a month). This new system will revolve around posting ads for virtual services and the best part of it, according to him, is that you’ll get paid first and do the work later. You may have seen the sales video and found the program to be an excellent opportunity for you this year, but you want to know more about it before making your final decision. So, is Wealthy Agency a scam or your road to financial freedom? You’ll soon find out from this Wealthy Agency review, where I will share with you all the info about this program. In fact, there are some important things you NEED to know before joining! 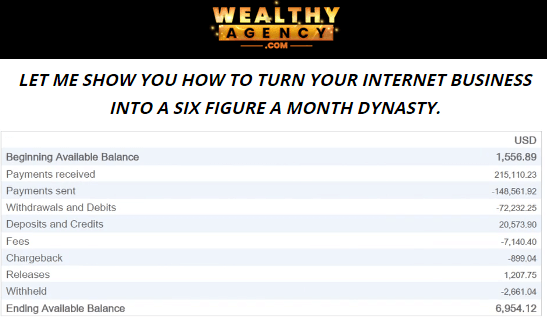 Wealthy Agency is a program that claims it can help people build a six-figure a month business ($100,000 a month). This program is created by Jamie Lewis, a seasoned internet marketer. This program revolves around building a virtual agency where you will be selling online services like writing, transcription, virtual assistance, and acting to other people. The way Jamie talks and presents this program may give you an impression that you don’t need a lot of time and effort to start this type of endeavor. In my opinion, you cannot build a successful virtual agency overnight; it takes time, effort and a bit of patience before you can achieve it. That is one of the reasons I don’t recommend this program – especially if you’re still just starting out with your online career, because it has several red flags that, in my opinion, makes it a risky investment. I would suggest that you look for other great opportunities that are more beginner-friendly and will reveal to you the real requirements of creating a sustainable income online. What is Wealthy Agency and what does it offer? The first time I saw Jamie’s video, I was a bit skeptical because he likes to flaunt his wealth and cars. For this particular program, he rides a new Bentley, and it’s clear why he does this, and it’s merely to lure you closer to his program by showing what kind of lifestyle he might be able to help you get. I also reviewed another of his program before called Profit Injector, which also has the same hype and antics on the sales page. It seems Jamie is a master of hype, but the good thing about him is he is presenting the product without using freelancers to impersonate the owner of the program. He also explains how his system work, which is a good sign since it’s not another one of those scam programs out there, who hides the details of their system. For this particular program, you will apparently get the money before you make any investment and you’re not required to spend your money or time creating products. So, what’s this program about? According to Jamie, you’ll be creating a virtual agency that will be selling online services like writing, transcription, virtual assistance, and acting to other people. As for me, it’s not a bad idea but what I don’t like is how he make it sound like it’s so easy to do. The way he talks and presents this program to you may give you the impression that you don’t need a lot of time and effort to start this type of endeavor. In fact, based on his explanation you only need to activate it once, and it will work for you 24/7. In my opinion, earning $100k per month is NOT impossible, because some online marketers are really making this kind of money. But this kind of success is NOT achieved overnight; it takes time, effort and a bit of patience before you can achieve it. Honestly, there are some things I don’t like on their sales video like showing clippings and photos of how luxurious his life is. As for me, it feels superficial and NOT a genuine way of presenting a program, but that’s just my opinion. I’m not questioning Jamie’s capacity especially his technical skills when it comes online marketing but showing people his brand-new Bentley and boasting his luxurious lifestyle is a bit over the top for me. It feels like he is giving you the impression that you will acquire a fortune when you join his program, which, in my opinion, is not a good way of promoting a product. That’s why I want to share with you some of the red flags I’ve uncovered from his sales page that I think you should know about. One of the first things I’ve noticed on his sales video is the claim that his system will allow you to get paid fast so you can start living the high life, which made me skeptical because it sounds like a get-rich-quick scheme. He makes it sound like there’s an automated system that will do everything for you. His sales video is full of overhyped claims, but he is not telling you everything about his system. Since if you’re going to base everything from what he is saying on the sales video, it feels like when you activate the system, it will do everything for you. In my opinion, claiming that the money will come on autopilot is a big red flag for me, because there will always be work, and you can NOT expect an automated software or system to do all the work for you. I hope that you take this red flag seriously before you decide to join this program. The primary business model of this program will revolve around building a virtual agency, which is NOT as simple to set up as it seems. Also, there’s no guarantee that you will earn a lot of money because you are required to spend some money too. Not to mention, that there are several major freelancing platforms on the web today. Starting everything from scratch is NOT a walk in the park. You also need to keep your prices low, so your prospects will choose you over other agencies with the same services you offer. You’ll also need to have some technical skills on how to maintain a freelancing agency and how to get the right freelancers for the services that you offer. Overall, this is NOT something that a complete beginner can do without undergoing some extensive training, which will take time and effort. So, is Wealthy Agency beginner-friendly? In my opinion, it’s NOT for beginners because you’ll need technical skills and some understanding of how to run a business to start a freelancing business/agency. You also got to have the money to invest in various activities like hiring the right freelancers, promoting your agency via paid ads, and other operating costs of the business. I urge you to consider this red flag before you decide to purchase this program. The initial fee that you need to shell out for this program is $29, which will give you access to the member’s area where you will also find a step-by-step video training about starting a virtual agency. After paying the initial fee, you’ll see several upsells on his membership page. It seems good enough for $29, but you will also see several upsells on their member’s area which will be worth $600 in total. It’s NOT that I’m against these upsells, but what I don’t like is the lack of transparency since Jamie didn’t reveal these upsells on his sales video. So, this leads you to believe that you will only spend $29 and you’ll be able to make the kind of money he claimed on his sales video. But in reality, you will be strongly encouraged to buy these upsells since it will give you access to Jamie’s high-level training videos and other tools that could move you forward in your campaign. Without these upsells, it will likely be hard to get anywhere.